Next up in my Germguardian reviews, I decided to take a look at the AC5350B air purifier as t’s a moderately-priced unit with many different features. It offers a 4-stage filtration system, a filter life indicator, a programmable timer and it can service a room up to about 230 square feet. I really wanted to check out the UV-C technology which i’ve not come across before. The manufacturer claims it can kill germs and deal with odors. I also liked the tower design of this model which makes it easy to find space for and a 5-year warranty attracted me as well. I was looking for a 4-stage filtration system but in reality found only 3 different stages. Germguardian combined the pre-filter and the carbon filter into one but views them as 2 separate stages. In any case, this is just a small advertising trick which doesn’t make the air purifier any less attractive. UV-C technology – This is the first filter I reviewed with UVC technology present. UV lamps are known for their ability to deal with germs and bacteria in the air so I appreciated the manufacturer including it into an air purifier. However, I’ve done some research and found that UV-C lamps can be dangerous if looked at directly. The UVC radiation can damage the eyes as a result of excessive exposure, so children shouldn’t be left alone with the device. Fortunately, the UVC lamp can be turned on and off. The light bulb lasts about 12 months on average and a replacement will cost about $25 Activated carbon filter – The AC5350B is equipped with a standard activated carbon filter that takes care of odors from pets, cooking and smoke etc. This filter is a must-have for all purifiers. In this unit, it’s combined with a pre-filter which isn’t replaceable. You need to clean it with a brush or a vacuum cleaner. I would recommend doing this once a week. The carbon filters can be replaced, however, for some reason, the manufacturer suggests replacing it only with the HEPA filter since it’s called a “combination filter”. A four-pack of replacement carbon filters will cost you about $15 True HEPA filter – The unit is equipped with a True HEPA filter which takes care of 99.97% of 0.3-micron particles and larger. 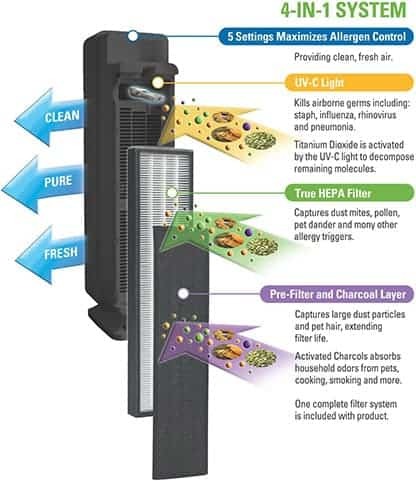 It takes care of pet dander, pollen, allergens, dust mites, mold spores and more. It’s recommended to replace this filter once every 6 -12 months depending on the conditions you use it in. The replacement filter will cost about $30 Overall, the GermGuardian AC5350B has a solid filtration system, which, considering the moderate price of the model, is rather appealing. After browsing through hundreds of reviews I was surprised to find only a couple bad ones. The filtration system of this unit does its job well. When I first looked at this air purifier, I immediately liked its sleek design. The tower unit is about 28 inches tall and weighs only 11 pounds. Full dimensions are 9.1’’ x 6.7’’ x 27.6’’. The air purifier looks like a large speaker and fits into any living room, bedroom or even child’s room décor and since it’s rather light, it’s easy to carry around. Unfortunately reports suggest that the AC5350B is pretty fragile. You need to be careful not to drop it since it can easily be damaged. The control panel is located on top of the unit. The easy-to-operate digital controls allow you to change the fan speed, turn the UV-C system on and off, and observe the filter and UV bulb replacement indicators. Even though it seems as if the unit can be placed in a corner or against the wall, the air is expelled out of the left side, which means that you need to keep the air purifier at least 12 inches away from any obstacles on it’s left. Of course, this doesn’t mean that you have to put it in the middle of the room, but hiding it is not an option either. Overall, I’m fully satisfied with the way this unit is designed. It looks simple yet elegant and doesn’t take up too much space. The only thing that can be a disadvantage to some people is the height. If you like hiding your air purifiers behind sofas and chairs, this one might be sticking out. The GermGuardian AC5350B is one of the quietest models I’ve reviewed. The unit has 5 fan settings, the first three of which are rather quiet. If you are a light sleeper, you won’t notice the purifier working when the fan speed is low. In fact, when set on 2 or 3, it emits a tiny white noise which helps people fall asleep. When the unit is set to the 4th or 5th fan speed, it’s a little louder. However, even the highest setting doesn’t make the unit louder than a normal conversation. I’ve read various reviews about the noise level this air purifier makes and I can say that a light sleeper can even set the unit to the 2nd fan speed and still have a sound sleep. I would give this air purifier one of the highest ratings for its noise levels and since this can be a deciding factor for many people, I think GermGuardian did a great job here. This unit is not equipped with any special sensors such as an air quality indicator. But I believe this is acceptable for an air purifier in this price range. It has a filter life indicator that lets you know when the HEPA filter needs to be replaced. Again, I would suggest replacing the activated carbon part more often than the HEPA filter. If you do that, the HEPA filter will last longer than the suggested 6 – 8 months. The unit also features a programmable timer. This is a great option for people who want to save energy by not running the air purifier around the clock. You can program it to turn itself on several hours before you come home from work and get the benefits of the clean air when you return. 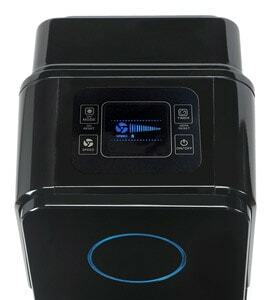 The GermGuardian AC5350B has an energy star rating as it only uses 70 watts. Since this unit is rather efficient, it’s not necessary to keep it running 24/7 especially if you are not home. This is one of the most efficient air purifiers that I have reviewed. It will certainly save you some money on the energy bills. The GermGuardian AC5350B has a CADR rating of 125+. This means it can do a good job of cleaning the air in rooms around 200 square feet, so I would suggest that it’s a good choice for bedrooms and smaller sized living rooms. If you place it in a larger room and keep it running 24/7 at the highest fan setting, it can clean a bigger area as well. However, you would end up with higher energy consumption, loud noise, and more frequent filter replacement. 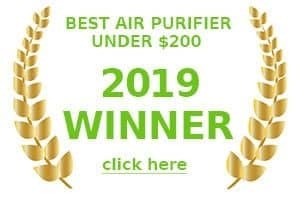 If the conditions you live in are out of the ordinary, such as heavy smoke or excessive dust, then you might want to consider installing this air purifier in a smaller room that’s worst effected. The AC5350B really is one of the best budget air purifiers for dust. The general manufacturer recommendations are usually aimed at an average household, so if the conditions you face are different, you might want to alter the air purifier routine to suit them. The unit comes with a 5-year limited warranty. The manufacturer will either replace the broken parts or the whole unit depending on the problem. The warranty is valid only if the air purifier is operated in accordance with the manual and the filters are replaced on time. In order for the warranty to work, you’ll need to purchase only genuine GermGuardian accessories. To take advantage of the warranty, you need to retain the proof of purchase and pay shipping and handling fees. After doing extensive research on the AC5350B, I can recommend it for people who have rooms around 200 square feet and are looking for an efficient air purifier for a really affordable price. This air cleaner gets a high rating from me for doing a great job purifying the air and being energy-efficient at the same time. However, I wouldn’t recommend this unit to families with small children due to the UV lamp feature. Even though it can be turned off, there is no child lock option on the panel. I would say that this is the only major disadvantage of this unit. The rest is pretty impressive for the price. Our latest air purifier in review was the GermGuardian AC5350B. Fair to say, We absolutely loved it. For a budget air cleaner, you will not get much better than the GermGuardian AC5350B.